What’s the next big thing in procurement according to CPOs? 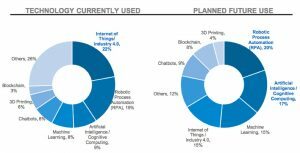 While there is some degree of geographical variation, most CPOs around the world are planning to invest more in internet of things (IoT), robotic process automation, and artificial intelligence or machine learning, according to a recent survey conducted by the University of Applied Sciences Würzburg-Schweinfurt with support from SAP Ariba. These findings come from a survey of 452 procurement and operational leaders around the world, representing a wide range of industries and revenues. Despite the diversity of the survey respondents, there are a number of similarities in their outlook on the future of procurement. Eighty-three percent of the respondents expect that digital transformation will wield a bigger influence on procurement and supply chain in 2018. Yet only 23% of respondents say that their functions have highly or very automated systems and processes. Twenty-one percent say that their processes are still mostly manual, and 54% have somewhat automated processes. Some interesting trends appear once the data is broken down by industry. The financial services, insurance and private equity industry has the least automation, with 29% of respondents reporting that their processes are manual. The consumer products and retail industry and the utilities industry have slightly higher rates of automation. In stark contrast is the automotive industry, with 87% of its respondents saying that they have highly or somewhat automated processes. The chemicals, health care and life sciences industries boast a similarly high rate of automation, and the manufacturing industry is about average among its peers. In terms of digital technologies, respondents report that they plan to invest in robotic process automation and artificial intelligence. There is also a surprisingly low, albeit growing, interest in blockchain: 3% of respondents say they currently use blockchain, compared to the 8% who plan to adopt it in the future. There are a number of regional variations worth noting. Asia- and Australia-based respondents report a significantly higher current adoption rate for IoT, compared with other regions. In addition, a higher percentage (38%) of Australia-based respondents report that they use robotic process automation. (For all other regions, the percentage is below 30%.) And the use of 3D printing is currently more prevalent among respondents based in Africa, Europe and the Middle East. As for planned future use, there is more of a consensus among respondents based in different regions. A slightly higher percentage of Asia- and Australia-based respondents plan to invest in artificial intelligence over robotic process automation, whereas in the other regions, the latter ranks higher. The top challenges that procurement organizations across the globe face are data quality, budget restrictions and talent shortages, both internal and external. Broken down by region, the top challenge cited by Asia- and Australia-based respondents is the lack of internal talent or know-how, whereas for all other regions, data quality and analytics pose the biggest obstacle for organizational efficiency. Respondents in all regions agree, however, that hard savings, cost avoidance and compliance are the top KPIs by which to measure procurement performance. In addition, more than three quarters of respondents report that their companies set CSR, sustainability and diversity objectives for their suppliers, and 88% say that creating purpose for procurement is a top priority. Lastly, the CPO role itself may be evolving into a more strategic, collaborative one. More than half of the respondents think that the CPO role is changing, and among respondents based in Asia and Latin America, two-thirds agree. 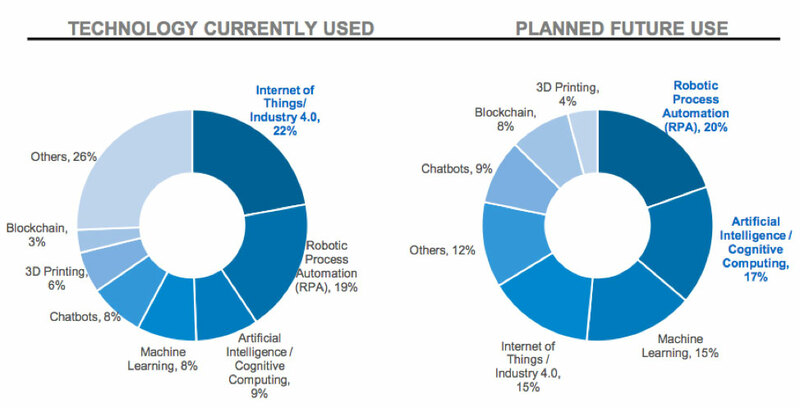 Forrester’s Artificial Intelligence Report Spawns 10 Hot Technologies — For Procurement, Which Ones Matter Most? I’m glad to read SAP Arriba’s results, confirming that more and more CPOs worldwide decide to invest in automation of repetitive, routine tasks (like accounting, data entry and invoicing). Such investment supports making best use of human brains for the more complex or creative tasks, like decision making itself, for instance. The good part is that there is no need for an ‘either/or’ attitude when it comes to robotic process automation and employees, because it seems that success in the long run belongs to a harmony between human know-how and robotic processing power. In line with the results discussed here, CiGen founders Leigh Pullen and Daniel Pullen observe good signs regarding RPA usage in Australia and New Zealand. Started in the latter half of 2017, a jump in serious investigation and adoption of RPA in the region is what explains the impressive 38% of current users among the CPOs who responded the SAP survey. In this context, I wish to highlight what I take to be the top reason to automate. That is, by cancelling out the significantly high risk of manually performing dull, repetitive tasks, RPA is a useful tool for maximally efficient use of a company’s available resources. I would conjecture that the swap between the rankings of current and planned future use of RPA and AI, respectively, in Australia reflects only the natural tendency to remain tuned in with the global trend, without allowing AI to lag significantly behind the use of automation in procurement.